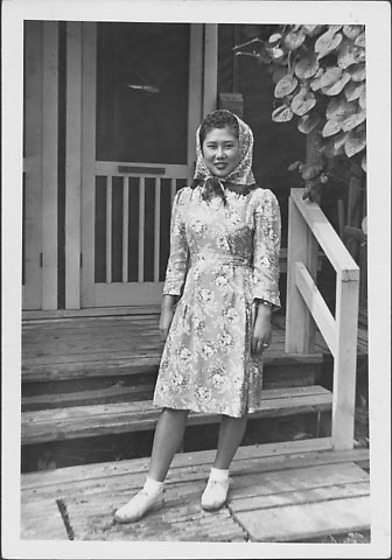 Full-length portrait of a smiling young woman in floral print dress and patterned, fringed headscarf standing in front of barracks porch steps at Rohwer concentration camp, Rohwer, Arkansas, 1942-1945. She stands with hands at sides with weight on proper L leg and proper R foot forward. Screen door behind her bears sign with name "Kashiwagi". Written in pencil on back, TRC: [circled letter] D.